This entry was posted in Babies 'n Stuff, Lucy, Single Parenting and tagged Lucy, sleep regression, toddlers by Cindy. Bookmark the permalink. She sounds sooooo much like Annie, with the bottle addiction and the non-sleeping. I tackled them individually. First I hit the bottles. I just slowly stopped giving them to her, and I put them all out of site. If she asked for a drink, I gave it to her in a sippy. It took about a month to get her off them totally. Oh, and she was…at least 18 months old. So whatever. As for the sleeping well…We just had to let her scream for a couple nights. Which, I don’t know if you have that option because Catie has school and you have work…maybe you can do it over a weekend? I just know that I HIT MY LIMIT after she woke up for like, the bazillionth time one night and I snapped. I had finally reached the point where I did. not. care. if she screamed all night. Anyway UGH. Total suckage for you. All I can think of is to move her bed into your room for now, and keep the bottles in the cooler beside your bed. It may be less of a wakeup for you that way, if you have the floor space and don’t mind. I only suggest it since you said you were open to co-sleeping, and a family bed doesn’t work for her. I never had the ability to do CIO and when I went through this stage I (painfully) slept the floor so she could see me until she drifted back off. I think ours was more of a seperation anxiety thing though she seemed to need the bottle as well. You’re smarter than me, you serve them cold! I foolishly got mine hooked on warm ones, so that caused me microwaving time. At least there were no stairs to climb in our ranch house. Motherhood…it feels like it just might kill ya sometimes! Another idea, depending on her comprehension, is not to remove the bottle, just remove it from night time. Bottles or milk “go to sleep” at night so they can’t be given to her. This idea worked for my son and when he realized there was nothing to be had if he screamed and woke me up, no food or drink or even a cuddle, he stopped doing it. Good luck and hope this stage passes quickly. Could you switch to water? It could still be in a bottle but that way it is just accessible to her (in her bed or on a night table or whatever) without you getting up? If she is thirsty, that might do the trick without you having to drag yourself out of bed. You could also talk up the transistion the day it was going to happen. I was stunned at how much my 16 month old could understand (but not say). My kid couldn’t handle a sippy until almost 15 months. She just couldn’t figure it out – day or night. She would opt to drink NOTHING until I relented and offered a bottle. I agree with the switching to water but what about doing it slowly? Start by giving her the bottle with 3/4 milk and 1/4 water and going steadily increasing the water until its 100% water. It might not be that she is hungry it might just be a comfort thing. Once its water you can hopefully just leave one propped up by her bed and if she wakes up she can get it for herself. 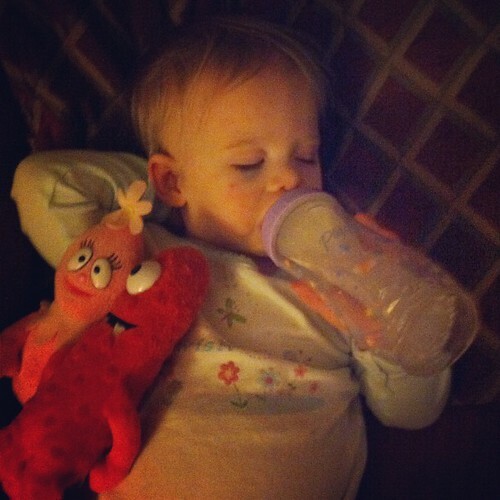 I had to do this with my son – he wanted the bottle to self-soothe himself back to sleep. So we just worked on it until I could just leave a bottle of water in his bed. It got to where he would carry the bottle to his room and put it on the nightstand his self. Every child is different, so Good Luck and hopefully you can start getting some uninterrupted sleep soon!